[INQ. NO. 1610E11] MSGolf which has been developed along with the growth of the Korean screen golf industry, has always paid attention to customers’ feedback and requests and has actively applied them to new products to meet customers’ needs. In addition, with its passion, the company has made as much effort to develop new products as its affection for golf. 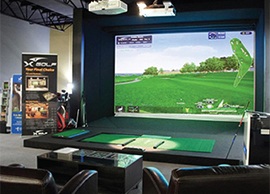 Myeongseung Golf’ golf simulator was named the official simulator for the international golf championship Presidents Cup 2015. Its distance measuring device and golf program are recognized by many golfers for accuracy and the realistic simulation of the golf ball’s impact. Its full HD 3-D graphics vividly capture the actual golf course, allowing golfers to enjoy realistic golf experiences in a new golf source of their own. MSGolf will continue conducting research and development until the screen golf industry reaches the globe as a culture beyond an industry. RD Tek has developed high-grade measuring systems and related simulators in the automobile and environmental industries. RD Tek has supplied this technology mainly to motor companies and government agencies since its inception in 2000. With the capabilities accumulated over the years, RD Tek developed and brought golf and sporting related products to the market. RD Tek has made rapid advances with products known as the world’s best and has consistently focused on technical development. 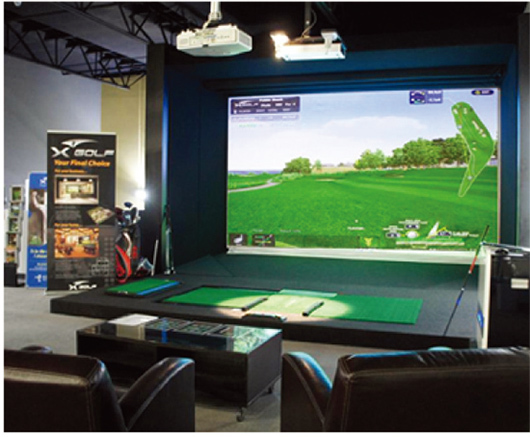 RD Tek offers an authentic indoor virtual golfing reality, using X-Golf’s patented technology to accurately analyze, interpret and simulate an individual’s ability. X-Golf allows players to experience golf courses from across the globe in the comfort of their own environment or their local X-Golf installations. At X-Golf, the company has considered every possible shot, and placed precision optical sensors everywhere required to capture and recreate your golf shot accurately and reliably. Not a generic shot, but your individual shot. When you hit the real ball in front of you, with the real club in your hands, up to eight sensor and high-speed processors instantly gather and interpret a huge volume of data in a blink of an eye to present the virtual representation of your real shot instantly. This sophisticated technology works seamlessly with market-leading, high-definition graphics to give you the most accurate and realistic virtual golf experience. As one of the world’s first real screen golf simulators, XGOLF continues to make unrivalled advancements in real data technology. RD Tek has developed high-grade measuring systems and related simulators in the automobile and environmental industries. RD Tek has supplied this technology mainly to motor companies and government agencies since its inception in 2000. With the capabilities accumulated over the years, RD Tek developed and brought golf and sporting related products to the market. RD Tek has made rapid advances with products known as the world’s best and has consistently endeavored for technical development. At X-Golf, the company has considered every possible shot, and placed precision optical sensors everywhere required to capture and recreate your golf shot accurately and reliably. Not a generic shot, but your individual shot. When you hit the real ball in front of you, with the real club in your hands, up to eight sensor and high-speed processors instantly gather and interpret a huge volume of data in a blink of an eye to present the virtual representation of your real shot instantly. This sophisticated technology works seamlessly with market-leading, high-definition graphics to give you the most accurate and realistic virtual golf experience. As one of the world’s first real screen golf simulators, X-GOLF continues to make unrivalled advancements in real data technology.